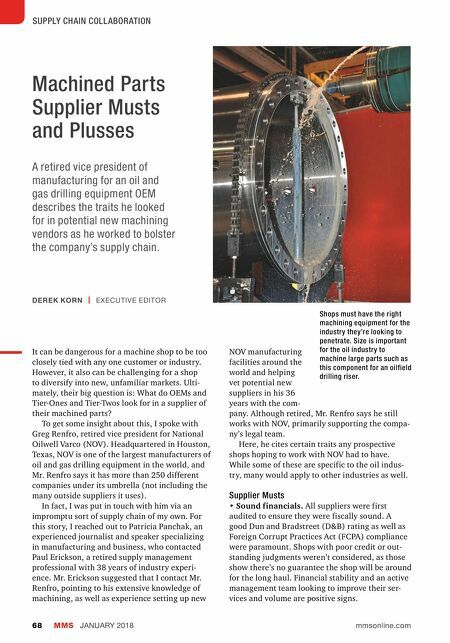 MMS JANUARY 2018 68 mmsonline.com SUPPLY CHAIN COLL ABOR ATION Machined Parts Supplier Musts and Plusses A retired vice president of manufacturing for an oil and gas drilling equipment OEM describes the traits he looked for in potential new machining vendors as he worked to bolster the company's supply chain. It can be dangerous for a machine shop to be too closely tied with any one customer or industry. However, it also can be challenging for a shop to diversify into new, unfamiliar markets. Ulti- mately, their big question is: What do OEMs and Tier-Ones and Tier-Twos look for in a supplier of their machined parts? To get some insight about this, I spoke with Greg Renfro, retired vice president for National Oilwell Varco (NOV). Headquartered in Houston, Texas, NOV is one of the largest manufacturers of oil and gas drilling equipment in the world, and Mr. Renfro says it has more than 250 different companies under its umbrella (not including the many outside suppliers it uses). In fact, I was put in touch with him via an impromptu sort of supply chain of my own. 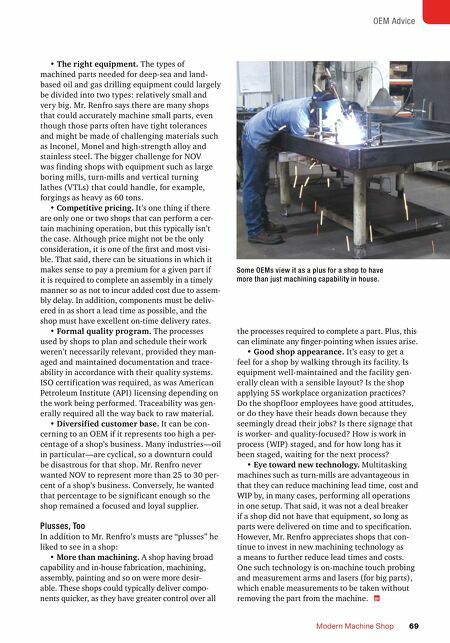 For this story, I reached out to Patricia Panchak, an experienced journalist and speaker specializing in manufacturing and business, who contacted Paul Erickson, a retired supply management professional with 38 years of industry experi- ence. Mr. Erickson suggested that I contact Mr. Renfro, pointing to his extensive knowledge of machining, as well as experience setting up new NOV manufacturing facilities around the world and helping vet potential new suppliers in his 36 years with the com- pany. Although retired, Mr. Renfro says he still works with NOV, primarily supporting the compa- ny's legal team. Here, he cites certain traits any prospective shops hoping to work with NOV had to have. While some of these are specific to the oil indus- try, many would apply to other industries as well. Supplier Musts • Sound financials. All suppliers were first audited to ensure they were fiscally sound. A good Dun and Bradstreet (D&B) rating as well as Foreign Corrupt Practices Act (FCPA) compliance were paramount. Shops with poor credit or out- standing judgments weren't considered, as those show there's no guarantee the shop will be around for the long haul. Financial stability and an active management team looking to improve their ser- vices and volume are positive signs. DEREK KORN | EXECUTIVE EDITOR Shops must have the right machining equipment for the industry they're looking to penetrate. Size is important for the oil industry to machine large parts such as this component for an oilfield drilling riser.